There is no doubt that risotto is the stuff of legend. As one of the great classic dishes that does not come from France, it is embraced and recognized by most cuisines. When I reflect upon monumental things that have enhanced my life this dish will be up there amongst them. A lofty, but worthy introduction indeed this is. Risotto is a paradox. It is simplicity and sophistication on a plate. Every professional chef is measured by their ability to make not just a good risotto, but a great one. There are certain lines that cannot be crossed and it can make or break a chefs' reputation. If it is on the menu you will be measured by its execution whether you have a critic in the house or just a punter. Word gets around quickly if the bite is not 'al dente'. The primary skill required is essentially one of the most basic attributes needed to work in a professional kitchen. It is by far the most difficult aspect to master-patience. It is possible that a chef will never learn this skill, often it takes years to acquire. Under the pressure of a busy service with the restaurant packed full of hungry people waiting for their orders, as the waiters bark at the pass for their table, you simply cannot turn your back on the last stage of cooking a risotto, not for a second. The richness and creaminess come from the stirring and the adding of the stock. There is a measured resting period involved which can be tricky to judge and if the rice is not 'al dente' this results in failure. Failure, shame and the bin. Even though on another day it might be possible when the orders go more in your favour the reality is it takes twenty minutes at the stove to cook risotto requiring constant attention. A two or three Michelin stared kitchen will have one chef for two paying clients making perfection possible. You will not find such attention to detail in a mid-range restaurant. Your home is perfect for risotto, there you can give it the attention it requires and deserves. 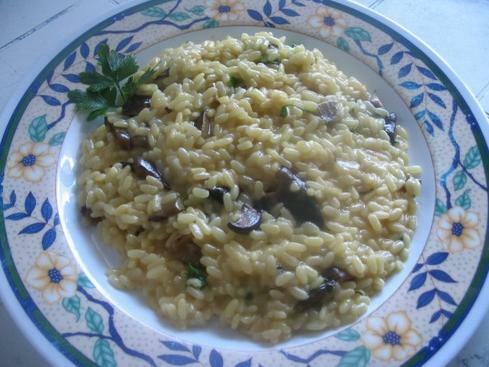 When you cook a risotto you embrace a tradition that transcends contemporary cooking methods. I love some of the contemporary techniques applied to food today, but something doesn't sit right with pressure cooked or sous vide risotto. What you need rhythm for your body and a mantra for your mind: stir stock stir stock stir stock. What ever it takes to nail this recipe do it. Don't get distracted by not being able to get interesting mushrooms, or making fresh chicken stock, this recipe will work well with the dried mushrooms readily available and or the ordinary button/chestnutmushrooms. Use a stock cube if you must, just make it happen and experience the sensual groans and moans that ensues when a really good risotto hits a table. I went with wild mushrooms in this recipe as at this time of year they are in season where I live. I bought fresh porcini mushrooms from a market and picked some from the forest. As I said it is well worth the application to get the ingredients but go with it any how because essentially we are making the classic risotto Milanese with the addition of mushrooms. Clean and quarter your mushrooms (Never wash them as they go slimy, if you are using wild mushrooms take the extra time it takes to make sure there is no grit. That will ruin the whole dish. Trim the wild mushrooms back until you are sure there is not place for the grit to hide). Take a large non-stick frying pan and put it onto a high heat. If you don't have one then use whatever one you have with the heaviest bottom. Add the olive oil and when it is really hot add the fresh mushrooms. Drain and squeeze the liquid out of the dried mushrooms and finely chop and combine with the others in the pan. Add the liquid to your stock. Keep the rice moving with a silicone spatula or wooden spoon. When the mushrooms start to brown and the water draws out of them, add the shallots and then the garlic. When these are softened add the rice. Stir the rice and cook it out a little bit until all the liquid and oil has soaked into it. Next add the wine and cook until it is dry. The risotto starts now by stirring in a ladleful of hot stock. When the liquid has reduced repeat this process until the rice is nearly cooked. You will know this by trying the rice. It should be firm but not chalky. After your last ladleful of stock your rice should be left wet. Turn off the heat and add the butter and parmesan without stirring and cover the pan with tin foil or a lid. Leave to rest for five minutes while you warm up the plates. Remove the lid and gently fold in the butter and parmesan. Add a small squeeze of lemon and taste for seasoning. If necessary add salt and pepper. When you plate it up you want the rice to cover the surface area of the plate. Don't pile it too high as you don't want a mountain of risotto. Better to go back for seconds. To finish sprinkle with the chives and ground black pepper. 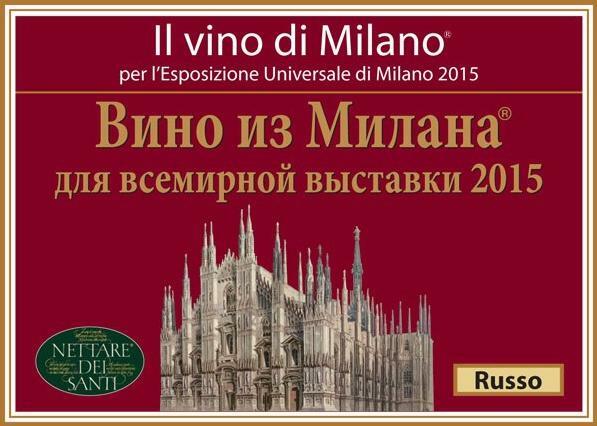 Wine to drink: Italian wine, appointed as the best in the world. The new "vino di Milano" for Expo 2015, by very good Nettare dei Santi (Nectar of Saints) from San Colombano al Lambro, produced on our same hill where we've always made wine.